Ever wonder about the 12th body system no one seems to be talking about? Like the name of this post suggests, this is a basic introduction into the endocannabinoid system, what it does, and how cannabis communicates with it. I have listed references at the end to help guide you into more detailed descriptions and scientific explanation of the ECS. the 12th Unknown // what is the endocannabinoid system? Humans are known to have eleven body systems- the digestive system, the circulatory system, the endocrine system, the integumentary system, the lymphatic/immune system, the muscular system, the nervous system, the renal system, the respiratory system, the reproductive system, and the good ole skeletal system. But what about the 12th, the most recently discovered yet most underrepresented system, the endocannabinoid system? At a glance: The endocannabinoid system (ECS) is the largest cellular communication system in the body. It is not an isolated system much like your vascular, endocrine, or digestive system. Rather, the ECS is distributed throughout the whole body, most notably in the central nervous system and gut. We can call this the “adaptogenic“ system as its primary responsibility is keeping the body in equilibrium. The ECS keeps bodily functions in equilibrium (homeostasis/balance), playing a role in several physiological processes including appetite, pain modulation, neuroprotection, mood regulation, fertility, immune functions, gastrointestinal functions, cancer, cardiovascular diseases, and sleep (1). The discovery of this system in the early 1990’s has significantly advanced our understanding of human biology and pathology. I must also note here all vertebrates have an ECS, not just humans. Both CB1 and CB2 can be found on just about all tissues in the body. This graph to the right helps us see where they are in concentration. Note that the central nervous system and the gut have the most receptors. CB1 receptors are found in the central nervous system, especially in areas responding to harmful stimuli, short-term memory, and basal ganglia. They are also found in the peripheral nerves, reproductive organs, bones, and most body tissues. Once activated, CB1 receptors respond to and modulate psychoactivity, inflammatory response, pain control, appetite, sleep, and memory. 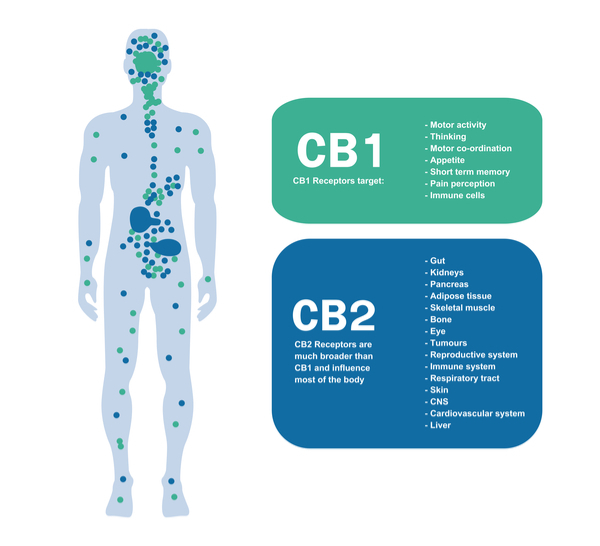 CB1 is mainly activated by the endocannabinoid anandamide, which we will get into later on. Cannabinoid receptor 2 (CB2) is expressed throughout the peripheral tissues of the immune system, brain, gastrointestinal system, and peripheral nervous system. When activated, and by which receptor agonist, the CB2 receptors respond to and control inflammation response, pain control, and work to limit scar tissue. CB2 is mainly activated by the endocannabinoid 2-arachidonoylglycerol (2-AG), which we will get into later on. A great way to envision these receptors is by remembering that the purpose of the ECS is to communicate to cells in order to achieve balance. So, receptors can be seen as the blow horns that tell cells what they need to do in order to achieve physiological balance. Cannabinoids are small molecules that interact with cannabinoid receptors. There are three categories of cannabinoids: endocannabinoids (endo- meaning endogenous or within the body), phytocannabinoids (phyto- meaning plant sourced), and synthetic cannabinoids. Cannabinoids do one of two things- they either activate cannabinoid receptors by directly binding to them as agonists (anandamide and THC), or they (indirectly) bind to the allosteric sites of the receptors as antagonists, ultimately inhibiting or down-regulating activation (example, THCV and CBD). In other words, cannabinoids influence the endocannabinoid system by turning it up and down via cannabinoid receptors. There are over 100 active phytocannabinoids found in the cannabis plant and at least five endocannabinoids found in the human body, there are also synthetic cannabinoids made in a laboratory by clinicians specifically engineered to activate + downregulate CB1 + CB2 receptors. No matter the source, each plays a distinct role in regulating the response of the endocannabinoid system. Endocannabinoids are cannabinoids that are synthesized in the human body (and in all vertebrates) in response to stimuli in the brain. Endocannabinoids are synthesized on demand and designed to interact with cannabinoid receptors throughout the brain and body (1). Endocannabinoids include anandamide and 2-arachidonoylglycerol (2-AG). Anandamide is synthesized in areas of the brain that are important in memory, pleasure, higher thought processes, motivation, and movement control. This endocannabinoid plays an important role in pain, appetite, and fertility. By increasing neurogenesis — the formation of new nerve cells — anandamide displays both anti-anxiety and antidepressant properties, as well. No wonder this chemical has been coined the bliss molecule. 2-arachidonoylglycerol (2-AG) activates both CB1 and CB2 receptors and is the primary agonist of the CB2 receptor. It is involved in a wide array of physiological functions, such as mood, cognition, energy balance, pain sensation, and neuroinflammation. Finally, you have the enzymes that breakdown endo- and phytocannabinoids are called FAAH and MAG lipase. Fatty acid amide hydrolase, or FAAH, degrades anandamide, converting it into ethanolamine and arachidonic acid. FAAH, paired with anandamide’s delicate structure, explains why we are not in a constant state of bliss. Interestingly enough, inhibitors of FAAH will lead to elevated anandamide levels and are being pursued for their therapeutic potential. 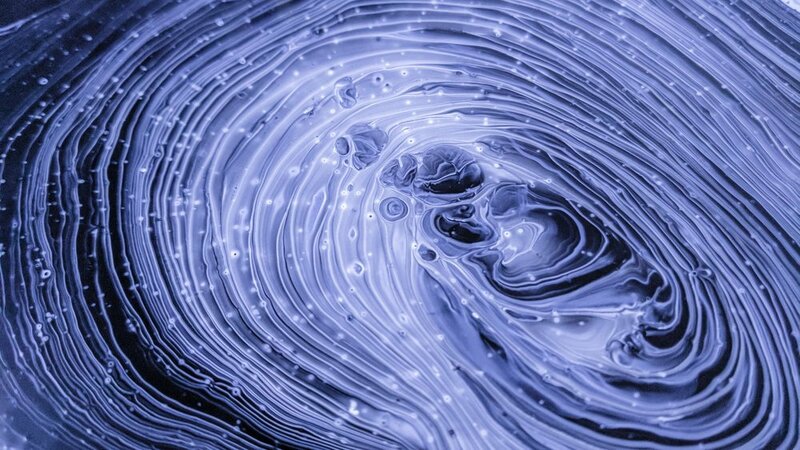 Monoacylglycerol lipase, or MAG lipase, is a key enzyme in the hydrolysis of 2-AG, meaning it breaks the endocannabinoid down by introducing it to water. Fun theory: About 20 percent of the human population cannot handle cannabis. This is so important to consider, as everyone's body reacts differently to any given chemical. A theory for this is the small amount of FAAH some people have, which causes an increase in the presence of anandamide. It's believed that people with lower levels of FAAH are generally happier and healthier individuals. It’s then theorized these same individuals may not take well to cannabis because it will cause too high of levels of anandamide, and without the enzyme to breakdown these molecules, they are lead to an increase in anxiety and paranoia. This system, and it’s dysfunction, has been linked to several chronic illnesses and disease, making it an important system to understand so we can move forward with nourishing it.